Now under the ESAB group, Victor products still dominate the gas world for cutting equipment. We specialise in supplying Used and Refurbished Gas Cutting Equipment but always will supply quality Gas Accessories to complement our machinery. Victor's founder invented the modern torch and regulator. With products like the revolutionary Victor EDGE™ regulators, ESAB Victor continue to offer the highest quality gas equipment available. Victor® 100 Torch Handles cover the full range of welding, cutting and heating needs. Choose from patented standard models. Performance matched CA1350 cutting attachment is available for this torch handle series. Light duty cutting attachment - may use any fuel gas with proper cutting tip. Medium duty cutting attachment - may use any fuel gas with proper cutting tips. Available in both CA411-1, for use with Series 1 tips, and CA411-3, for use with Series 3 tips, the CA400 Cutting Attachment offers an efficient Universal Spiral Head Mixer design for use with any fuel gas. Cutter Select ST1000FC allows you the flexibility to choose the exact accessory you want and only what you need. This heavy duty outfit cuts up to 5" (127.00mm) with accessories. Cutter Select ST900FC allows you the flexibility to choose the exact accessory you want and only what you need. This heavy duty outfit cuts up to 5" (127.0 mm) with accessories. The DFM150 series offers a range of products for the delivery of shielding gas in the arc welding process or any application where gas flow rates, versus delivery pressure, are the primary consideration. 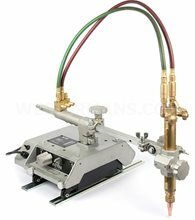 Welding equipment manufacturers Victor and ESAB under one umbrella of superior quality brands make a vast range of gas cutting equipment. Thermal Dynamics, Thermal Arc, ArcAir, Tweco, Victor Gas, Turbo Torch and Stoody. A very impressive product showcase was delivered at ESSEN, the international welding fair in Germany. Headquartered in St. Louis, Missouri, USA, Victor Technologies is a global manufacturer dedicated to developing innovative solutions for your cutting, welding and gas control applications. Victor Technologies employs more than 2,100 people in manufacturing, sales and service operations in North America, Latin America, Europe, Australia, Africa, the Middle East and Asia and delivers service excellence on a worldwide basis. With nearly a 100-year heritage of authenticity, innovation and a deep connection with end users, the brands include Victor®, Tweco®, Arcair®, Thermal Dynamics® , Thermal Arc®, Stoody®, TurboTorch®, Firepower® and Cigweld®. Celebrating 100 years, Victor Technologies now produce the widest range of equipment. THERMAL DYNAMICS has been in operation for over five decades and is a pioneer in plasma cutting systems. Its history goes back to Dartmouth College when Professors James Browning and Merle Thorpe of the Thayer School of Engineering incorporated Thermal Dynamics in 1957. Thermal Dynamics is a world leader that is setting the standard in flexibility, value and performance for advanced plasma cutting equipment. The manual systems, automated systems, manual torches, automated torches and full line of accessories cover the full range of plasma cutting applications. Today, Thermal Dynamics' innovative and performance proven products are the chosen plasma cutting systems for manual or automated cutting applications around the world. Thermal Dynamics' plasma arc cutting systems can be used to cut virtually any material, from light gauge to 4" (9.6 cm) thick, and range from highly portable 110V units for HVAC work to the most sophisticated high speed, high definition plasma cutting systems for high precision fabrication. By using Thermal Dynamics equipment save time and cost and add efficiency to your operation. View our dedicated page to Thermal Dynamics or view the plasma cutting machines we have in stock today. THERMAL ARC, leaders in arc welding technology, provides a complete line of superior quality power supplies and accessories to meet your exact arc welding requirements. With an extensive array of welding power source products including STICK (SMAW), TIG (GTAW),MIG (GMAW), multi-process, wire feeders and plasma welding systems. The ArcMaster® series of portable lightweight inverters are a part of the Professional line up from Thermal Arc. High performance,compact and powerful inverters are a tradition at Thermal Arc, you will immediately notice advantages in the ArcMasterline up. If you want improved productivity, reduced component reworks, and multiple process capabilities from your equipment buy Thermal Arc equipment. With an unbeatable range of standard features in the Synergic Pulse MIG Welding Equipment, this state-of-the-art technology is designed to meet the rigorous demands of a wide range of welding applications. View our dedicated page to Thermal Arc or view the new and used Thermal Arc machines we have in stock today. VICTOR GAS EQUIPMENT was founded in 1913 by L.W. Stettner. Stettner, a welder by trade, suffered the loss of an eye from a welding accident and subsequently set out to design and build better, safer welding products. His designs for welding and cutting torches and regulators were quickly accepted and the original San Francisco-based Victor Oxy-Acetylene Welding Equipment Company grew rapidly. Stettner's "safety oriented" designs resulted in numerous patents and firsts including spiral mixers, gooseneck nozzles, and safety regulators. In time, the company name was shortened to Victor Equipment Company. Victor's product line and business volume grew steadily and expanded capacity was needed. The original San Francisco manufacturing operations were relocated to new headquarters in Denton, TX in the mid 1960's. Today, Victor Gas Equipment is the world leader in gas equipment, providing superior quality, reliable products, safety, and performance resulting in numerous product innovations including patented built-in flashback arrestors and check valves for torches. Victor also includes oxy-fuel cutting and welding equipment such as oxy-acetylene and oxy-fuel welding and cutting equipment, torch handles, cutting attachments, straight cutting torches, regulators, cutting tips, welding nozzles, cutting and welding outfits. Victor products cover the full range of needs from general industrial to heavy duty mill and foundry requirements. Victor's gas apparatus line is the most complete selection offered from any manufacturer and the only one offering users the (patented) safety benefit of built-in flashback arrestors and reverse flow check valves. 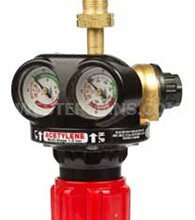 Why not try the NEW Victor Regulator with SLAM technology? 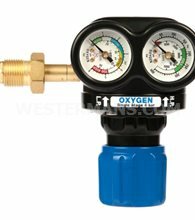 The knob on the regulator is shock absorbing and has a 3 stage crumple zone to prevent the gas bottle flying off on impact in the event of a cylinder fall. Perfect for places that need safety conscious equipment; shipyards, biochemical etc. Ask our Sales Team for more details or download the Victor Gas product brochure here. ARCAIR provides a complete line of air carbon arc products for the wide-ranging gouging needs of fabrication plants, shipyards, railroads and farms. It is also a leading supplier of underwater cutting and welding torches and manufactures the popular SLICE exothermic cutting system, which is capable of cutting through any material. In 1936, the Townsend Welding Equipment Company was born in the basement of Ray Townsend's Wichita, Kansas home. Townsend was driven by the idea that improved ground connections would result in improved quality welds. That same year, Ray Townsend began selling his now-famous "Red-head" ground clamp. In 1937, the company name was shortened to "Tweco" and a national advertising campaign was launched. In 1938, Ray Townsend added electrode holders to his product line and he moved the company out of his basement to a store front. Within a year, continued growth led the Townsends to purchase land and build the first Tweco factory, which was occupied in 1940. World War II created a huge demand for arc welding for armament, tanks and ships, and for Tweco products. The product line was expanded to include new metal arc holders and a new line of carbon arc holders. Cable connectors with a "quick-connect" type feature were introduced. During the 1940's, Tweco adopted the slogan "If it goes on the end of a welding cable, Tweco makes it." Business continued to boom, and in 1950, Tweco moved into a new plant. During the early 1960's, Tweco began to study the GMAW market in an effort to produce a significantly better MIG gun. Finally, in 1968, Tweco developed the first MIG gun that it felt matched the quality of the Tweco product line. The new gun was introduced to the world at the 1969 AWS Welding Show. Spurred by the success of the new gun and the introduction of the highly popular, patented coaxial Cablehoz®, Tweco emerged as an industry leader. Growth once again necessitated a move, this time to the company's current Wichita, KS manufacturing facility. The company was then acquired by Thermadyne in 1987. Tweco has now produced more than two million MIG guns and is the industry leader in the production of MIG guns and cable, manual arc welding electrode holders, and accessories. The Tweco line includes an extensive array of products from the basic manual welding tools and accessories to MIG guns, consumables, and a complete selection of products for precision robotic welding applications.